Season 5 has many memorable episodes (‘Cape Feare’, ‘Rosebud’) and rarely have I seen this episode mentioned as ‘one of the best’. Despite some great references to Howard Hughes and Stanley Kubrick alongside a story that breaks down Marge’s do-gooder image by portraying her as a addictive-gambler, this truly is my favourite of the fifth season. As a film-fan, it is always the film references that I love – almost as if the creators of the show and I are sharing a private-joke. In this episode, there is a laugh-out loud moment when the episode references Rain Man. 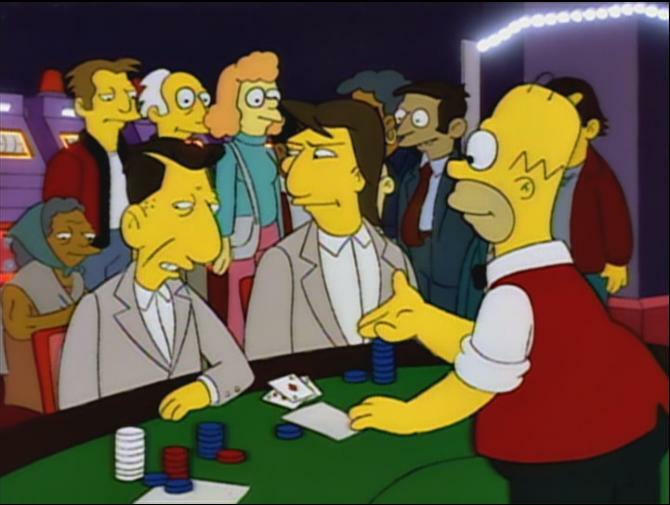 The characters portrayed by Dustin Hoffman and Tom Cruise visit the Burns Casino and, as in the film, Hoffman’s Raymond Babbit reacts uncontrollably when at the black-jack table … but this time Homer responds in the same fashion, shouting and screaming in the exact same manner. Furthermore, the episode completely changes Mr Burns character into a Howard Hughes obsessive. We see his crazed cleanliness and obsessed attitude over ideas – such as a plane called the ‘Spruce Moose’. It was a whole decade later that Leonardo DiCaprio would portray Howard Hughes in the Oscar-nominated The Aviator. Homer: Hey Marge, after your big tantrum against legalised gambling, I bet it feels pretty weird to be in a casino. Marge: I was for the casino. Homer: Strike three, Marge! I remember that meeting and I have a photographic memory. 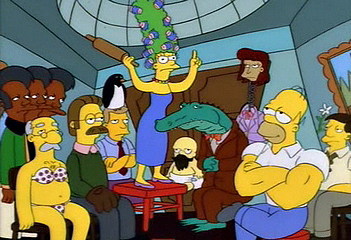 Marge: Legalised gambling is a bad idea. You can build a casino over my dead body. Blah blah blah blah blah. Blah blah blah, blah blah blah blah blah.